Basia's Polish Family: From Wilno to Worcester: Exactly how Polish is my DNA? Exactly how Polish is my DNA? My grandparents, and their parents before them, and their parents before them, all lived in Wilno. In their time, Wilno was one of the western provinces of the Russian Empire; earlier, Wilno was the eastern stronghold of the Polish-Lithuanian Commonwealth. For hundreds of years, at least, the Wilno region was a melting pot of ethnicities—Polish, Lithuanian, Jewish, Ruthenian, Tatar, German, Scot, and Italian (not to mention possible Swedish infusion from the devastating Great Northern Wars). When my grandparents emigrated from Wilno before World War I, they settled in a sizable Polish community in Worcester, Massachusetts. They were members of its Roman Catholic parish of Our Lady of Częstochowa. My mother and her siblings were educated at the parish's St. Mary's School, whose bilingual curriculum steeped them in Polish literature, history, and music. Although the intensive half-day of Polish studies had been phased out by the 1950s, when I received my diploma from St. Mary's High School in the mid-1960s, I was graduated from New England's only coeducational Polish Catholic high school. It never occurred to me that I was anything less than 100 percent Polish. 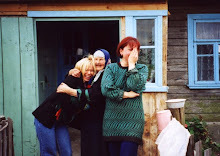 In 1996, I began researching and documenting my Polish ancestry. In 2002, I stepped off the paper trail to do my first mitochondrial DNA test; Oxford Ancestors identified me as mtDNA H, the most common European maternal haplogroup. 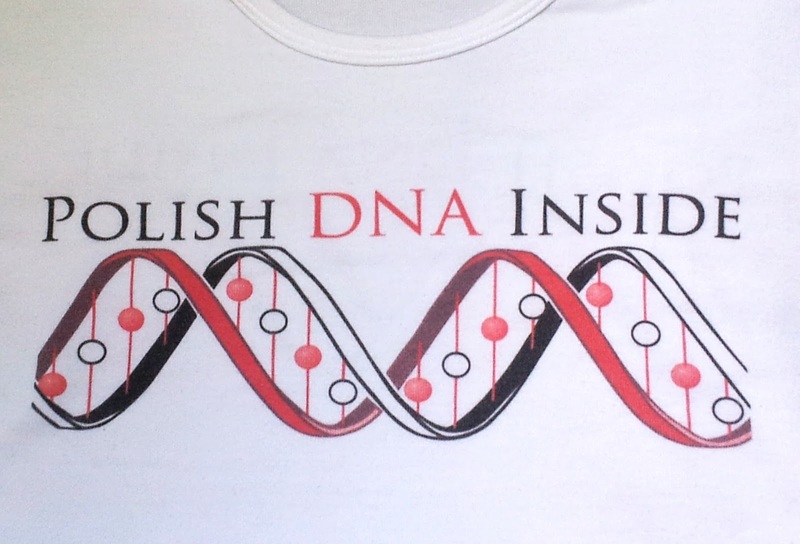 Unfazed by the fact that H encompassed about 40 percent of the continent's female descendants, I ordered a "Polish DNA Inside" T-shirt from Café Press. But I began reading books and more books about DNA. I lacked the scientific background to understand much, but the topic intrigued me. My mother had passed mtDNA H along to me, but what did my other ancestral lines contribute to my genetic makeup? What did I receive from my father and my grandfathers, whose Y-DNA I, as a woman, could not inherit? How did my paternal grandmother fit into the scheme of things? What did I share with my cousins? What did I hand down to my children? Testing had grown increasingly sophisticated in the years since my Oxford Ancestors test. As a woman, I could hope for more detail about my mtDNA heritage through newer, more refined tests. As a woman, I could not be tested to learn my father's Y-DNA haplogroup. I could, however, gain some insight into my ancestry beyond direct male and direct female lines by means of autosomal testing—and perhaps discover some new cousins in the process. After doing considerable research on genetic testing services, I decided to try Family Tree DNA. (Since then, I have also used 23andMe. I am equally satisfied with both companies, which are recognized leaders in the field.) What I particularly liked about Family Tree DNA was its plethora of projects—geographic, ethnic, haplogroup, surname—that seemed designed to facilitate exploring how and where any tester's ancestry might fit into the big picture of human evolution and migration. I had a goal: to identify the Y-DNA haplogroups of my two grandfathers, and the mtDNA haplogroups of both of my grandmothers (of course, I already knew my maternal grandmother's). The Y-DNA results loomed especially large. Both my father and my mother were born into Prokopowicz families, as I mentioned in one of my early blog posts. My paternal grandfather, Julian Prokopowicz (1895-1951), hailed from Radun parish in the eastern Lida region. My maternal grandfather, Aleksandr Prokopowicz (1878-1939), was from Iszczolna parish, a scant 30 miles to the west. Did Julian and Aleksandr share a common male ancestor at some point in the distant past? No amount of paper-trail research could ascertain that. Only Y-DNA testing could answer the question. My father and three of his four younger brothers had already died. Only his youngest brother, my one surviving uncle, could provide a genetic sample of my grandfather Julian's Y-DNA as well as my paternal grandmother Anna's mtDNA. (Men inherit their mother's mtDNA but do not pass it along to their children.) I was very apprehensive about asking my uncle to do the testing; he is a very private person. To my grateful delight and relief, he graciously agreed. I should note that, had my uncle not been willing and available, other testing options were possible in my extended family: five male cousins (my paternal uncles' sons) and one aunt (my father's one surviving sister). One male cousin and one aunt could have provided the haplogroup information I sought, but testing one person instead of two seemed optimal (read: simpler and cheaper). My mother's family also posed a challenge. Of my mom's three brothers, only one had fathered a son—my cousin and genealogy mentor, who died in 2000, survived by two daughters and one son. That son, my first cousin once removed, was the only living male Prokopowicz descendant of my grandfather Aleksandr, the only possible source of a Y-DNA sample. Without hesitation, and happy to further the family research his father had launched back in the 1980s, he too agreed to testing. Even though I already knew my maternal grandmother Stefania was haplogroup H, I expected that more current mtDNA testing might augment the information I received in 2002. With all four grandparents represented, I ordered our kits from Family Tree DNA in March 2010. Four months later, the Prokopowicz question was unequivocally answered: Julian Prokopowicz and Aleksandr Prokopowicz did not share a common male ancestor. They did not even share a haplogroup. They were descended from two distinct tribes that migrated to Wilno from different parts of Eurasia sometime during the past few hundreds or thousands of years. The same proved true of my two grandmothers, who descended from different "daughters of Eve," as human genetics professor Brian Sykes termed the mitochondrial DNA haplogroups in his groundbreaking 2001 book. Over the past three years, additional tests on our family's DNA samples have added more specificity to the initial findings. For Y-DNA, we advanced from 12 to 67 markers and added on SNP tests. For mtDNA, as new tests became available, we progressed to FTDNA's mtDNAPlus and mtHVR2toMega. To explore our other ancestral lines, we used Family Finder autosomal tests; I have used 23andMe for that same purpose. It's my hope to find appropriate long-lost cousins who might be tested for my grandparents' other ancestral lines: a female descendant of Julian's mother, Anna Bogdan; a male descendant of Anna's father, Adam Blaszko; a female descendant of Aleksandr's mother, Paulina Zubrzycki; and a male descendant of Stefania's father, Antoni Ruscik. I am curious about whether testing those family lines would reveal even more diversity in my heritage. I need a new T-shirt! That would be in line with the haplogroups observed to date in the Family Tree DNA Belarus-Lida Region project http://www.familytreedna.com/public/Belarus_Lida_Region/ that I founded a couple years ago. Y-DNA haplogroups represented there are E1b1b1, I1, J2, N1c1, R1a1a, and R1b1a2. Mitochondrial haplogroups are H, H23, H27, I, J1c1, K, N1b1e, R0a, T2, T2b, T2e, U, U7, and W6-C16192T. The project members' range of haplogroups—to some extent, at least—reflects the ethnic mix that characterized Wilno for so many centuries. It has been eye-opening to me to consider that I am, in effect, a one-person melting pot—a genetic synthesis of at least a few of the disparate human tribes that found their way to Wilno over hundreds or thousands of years. DNA testing answered my first, rather simple question: yes, I am descended from two unrelated Prokopowicz families. 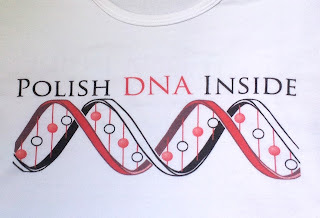 But it has raised some other questions and issues, not the least of which is this: I need a new T-shirt, one that correctly proclaims "More than Polish DNA Inside."